In order to get started, you'll have to start from a patient's profile. 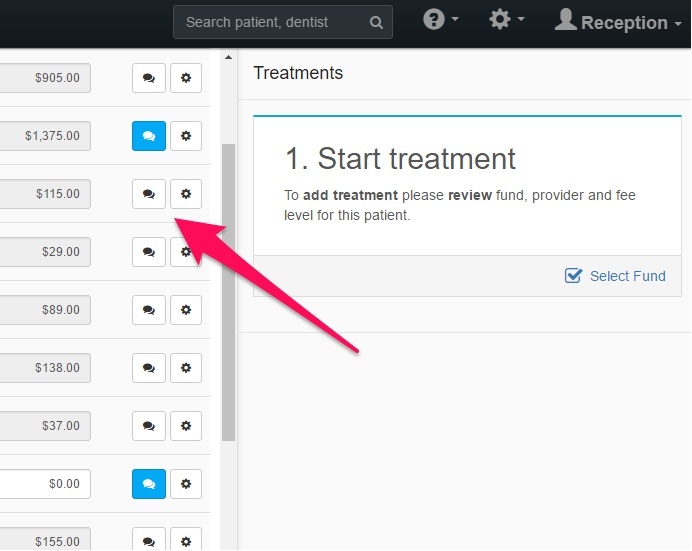 Go to Treatment and click on the treatment note button. Any patient's file is fine; you just need to get to the Treatment Collection box. Clicking on the treatment note button will open the dialog box to access your Template Collection. Treatment notes are often personalised for individual preferences and can be unique to the user. Our Template Designer is a form builder that allows you to customise your questionnaire, which can be a valuable time-saving tool in the treatment note creation process. Developing a template can be as quick and easy as having a simple Textbox with default values so you don't have to type the same information frequently. You can also customise the template to save information for a specific visit or treatment. For example, saving the exact material that was used for a filling or what local anaesthetic was used and how much. The main idea is to spend more time and thinking on designing your template in order to make the treatment note creation process as quick and easy as possible. The easiest way to do this is to customise an existing template. NOTE: Normal users only have permission to customise treatment note templates in their own collection. They will need an Administrator to create a template collection if they don't see an "Edit template" menu option as seen below. Click the Star icon (1) to add the template to your "Starred" folder. Click the Starred folder (2) to view your favourite templates. Find the template that you want to customise, click More and then click Edit template. This is only visible if you have the required permissions to edit your note templates. If you do not see this option, contact your administrator. To add questions, click on + button. You can also choose a question type and Drag the question into the template designer. N.B. : After making any changes to your treatment note templates, remember to click on Save to make sure you don't lose your progress. Multi Line Textbox is our free text "Question Type" option. It allows you to write whatever information which you desire. Free text works best when you need to evaluate a situation with many variables or if you just want something simple. Creating the template: Enter question text (1) and default answer text (2). You could also choose to leave the default answer textbox empty. Single Line Textbox "Question Type" is the similar to Muti Line Textbox, in that they also provide a free text option. It works best when you need to evaluate a situation with many variables but you don't need all the space that comes with the Multi Line Textbox option. Multiple Choice Checkbox is a question type that allows you to predetermine all possible answers that you may encounter during testing and treatments. This option allows you to select multiple answers for a single question. Knowing all possible answers upfront will help to save valuable time entering different options during the treatment note creation process. Creating the template: Enter question text and then the possible answers text. Single Choice Radiobox is a question type which is also similar as the Multiple Choice Checkbox, however you are only allowed to choose one answer. Single Choice Dropdown is a question type which is similar to the Single Choice Radiobox in that it only allows one answer, however it is selected from a dropdown menu. Now that you've got the hang of it, you can learn how to create advanced treatment note templates.